1) Calculating the forward pass. 2) Calculating the backward pass. 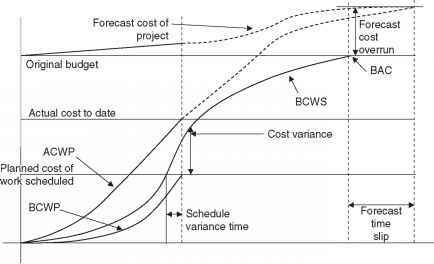 3) Calculating the activity float and determining the critical path of the project. Each of the above stages will be examined in detail and the calculations applied to the network illustrated in Figure 3-20. Forward Pass : Calculation of early start and early finish dates. Early Start : Earliest time an activity can logically start. Early Finish : Earliest time an activity can logically finish. Target Start : Imposed start by planning engineer and means that the activity to which the date applies will not start BEFORE the time shown, but may start at a later date if the logic so dictates. FORWARD PASS - Calculation of early start and early finish dates. EARLY START — Earliest time an activity can logically start. EARLY FINISH — Earliest time an activity can logically finish. 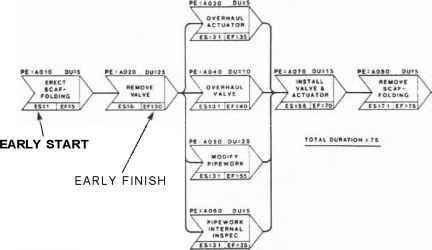 TARGET START — Imposed start by planning engineering and means that the activity to which the date applies will not start BEFORE the time shown, but may start at a later date if the logic so dictates. When drawing networks, time should always flow from left to right. It should also be remembered that when working in days, the day begins one minute past midnight and ends at midnight. Therefore, subsequent activities always start the day after completion of the preceding activity. 1. Activity AO 10 starts on day 1 and has a duration of 5 days. The EARLY START (ES) of this activity is 1. The EARLY FINISH (EF) is calculated as ES plus the duration, less 1, which results in an EF of 5. 2. Activity A020 cannot start until A010 is complete, therefore, A020 ES is day 6 with a resulting EF of day 30. 3. Activity A070 cannot start until all preceding activities are complete. Therefore, the ES of A070 is day 56, which is determined by the completion of Activity A050. 4. Activity A080 has an EF of day 75, which means that the project is going to take a minimum of 75 days to complete. BACKWARD PASS - Calculates latest start and finish times for activities and constraints. LATEST FINISH - The EARLIEST late start date of any succeeding constraint leading from the activity. LATEST START - Latest finish less activity duration. TARGET COMPETE — An imposed completion date — used to increase the criticality of an activity. The backward pass calculation STARTS AT THE END AND WORKS TOWARD THE FRONT. The calculation process, therefore, starts from the final activity of the network. 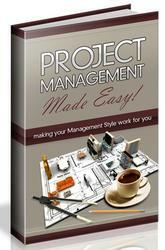 This should also be the last activity of the forward pass, and is the activity that determines the project duration. In the illustrated example, Figure 3-21, A080 is the final activity. : Calculates latest start and finish times for activities and constraints. The EARLIEST late start date of any succeeding constraint leading from that activity. Latest finish less activity duration. : An imposed completion date-used to i ncrease the criticality of an activity. 1. The EF of activity A080 is day 75, and as this is the final network activity, this is the LATEST FINISH DATE (LF). The LF date for activity A080 is entered as day 75. 2. The LATEST START DATE (LS) is calculated by deducting the activity duration from the LF. Activity A080 LS is therefore calculated as 75 less 5, plus 1> resulting in a LS of day 71. 3. The LF of activity A070 is subsequently calculated as day 70, due to the LS of A080 being day 71 and the use of days as our unit of calculation. The LS of A070 is then calculated as day 56. 4. The LF of activities A030, A040, A050 and A060 is then day 55. 5. An examination of activity A020 shows that it has four constraints leading into it from the backward pass. The EARLIEST LS is than allocated as the LF date of activity A020. The earliest LS is the constraint leading from activity A050 with a LS of day 31. The LF of activity A020 is therefore day 30 with a LS of day 6. TOTAL FLOAT — The amount an activity can be delayed without impacting the end date or intermediate target date of a project. FLOAT CALC - Total float = Late start less Early start. CRITICAL PATH — The path through a project with zero float. Any activity delayed on this path will automatically impact the project end date. Figure 3-22 illustrates the following results: Activity A030 has 20 days float, A040 15 days float, and A060 20 days float. This means that these activities can be delayed by the float duration without impacting the project end date of 75 days. The critical path runs through activities AO 10, A020, A050, A070 and A080. Should any of these activities be delayed, the project end date will be extended. The critical path is normally shown by either a thicker line, or in some other color. RESOURCE — Any element exerting a limitation on an activity. Figure 3-22. Float and Critical Path. Total Float : The amount an activity can be delayed without impacting the end date or intermediate target date of a project. Float Calc : Total float = Late start less Early start. Critical Path : The path through a project with zero float. Any activity delayed on this path will automatically impact the proeject end date. RESOURCE SCHEDULE - Plan that is limited by available resources. SCHEDULE DELAY - The amount an activity is delayed through resource limitations. RESOURCE PROFILE — The quantity of resources available for scheduling. ACTIVITY PROFILE — The number of resources required to complete an activity. CALENDAR — Details activity resource rest periods and holidays. 1. Two scaffolders from day 1 until day 5. 2. Two pipefitters from day 6 until day 30. 3. Five pipefitters from day 31 until day 35. 4. Three pipefitters from day 36 until day 40. 5. Two pipefitters from day 41 until day 70. 6. Two scaffolders from day 71 until day 75. 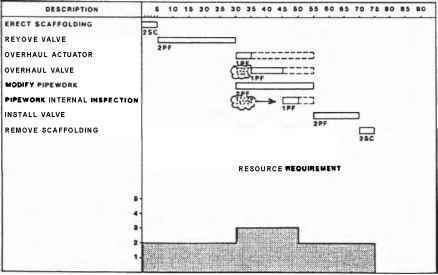 As shown in the revised barchart, Figure 3-24, the earlier peak of five pipefitters has now been reduced to three by taking up some of the float. The project end date of 75 days is still being achieved, with a lower number of men. This technique is called RESOURCE LEVELLING. Whenever possible, the development or evaluation of a schedule should be carried out with alternative methods. This will provide a checking procedure which can increase the quality of the schedule workup and provide a schedule with a higher degree of probability. Schedules should be developed on a tight, but achievable basis. An 80% probability is a good basis for a schedule. Too optimistic and too pessimistic schedules are not recommended as they will provide a poor base for control and performance. The following are three methods for developing and evaluating schedules. This is the most common method and, very often, the method used. The experience and capability of the schedule engineer are vital for a quality schedule. When the type of project or major project conditions are outside the experience of the schedule engineer, a poor schedule can be the result. Thus, an alternative checking method is necessary. An historical scheduling data base can be a very effective tool for developing or checking schedules. Standard schedules, by size and type of plant, would be available. 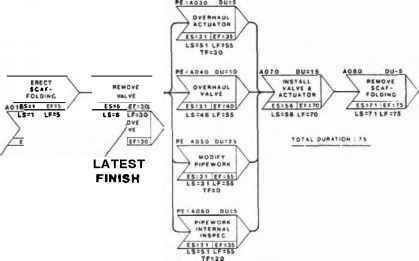 Standard overall progress curves for material commitment, engineering and construction would quickly and easily provide manpower histograms and an excellent check of the progress curves of any project. Peak rates of progress would be known. Ideal sequences of activities, dependent relationships and lengths of durations would be available. Probable critical paths would be identified. All of the above could provide an outstanding method for checking personal judgment and opinion. However, it should always be remembered that any project can lie outside the history of past projects and also the historical data base must be constantly updated so as to properly reflect current experience. This method can improve a schedule evaluation by substituting quantity analysis for personal judgment. The method uses battery limit area, manhours, and labor density data to calculate overall construction duration. Construction duration is calculated using a trapezoidal approximation of time for manpower build-up, peak and rundown over the construction period, and then evaluated using the estimated construction manhours in conjunction with the craft labor density. The success of this evaluation method depends on the quality of judgment and experience used to assess the density level. Manpower build-up and rundown can be verified with an historical data base, if available. This method, when properly carried out, will generally provide the best result of the three scheduling methods. The procedure is covered in further detail.